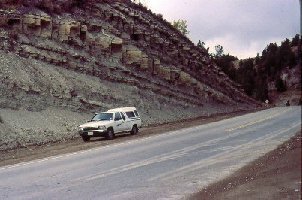 In Utah, at the southern border of the Ashley National Forest, US 191 cuts through a mile-thick tilted layer of varved shale and limestone which is part of the Green River Formation (G.R.F.). The last time I drove through there I stopped to study the limestone. I had just come from Meteor Crater in Arizona, where I had picked up a copy of O. Richard Norton's book, Rocks From Space. Naturally, I was thinking about meteorites while I studied a curious arrangement of rusty looking marble-sized (and slightly larger) lumps in the rock layers. They appeared to have rust-free cores, made of a slightly darker version of the local limestone, and were surrounded by some kind of rusty shell - the rust appearing to have spread into the surrounding limestone, although not into the cores. I grabbed a few of the rusty lumps and sent them to Dr. Gary Huss, then at Caltech. (Dr. Huss turned out to be a grandson of a famous meteor hunter named H.H. Nininger.) 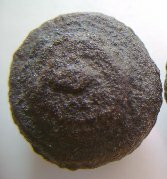 Dr. Huss ran some tests on the lumps and concluded that they were what geologists call "iron concretions" and were not of E.T. origin (e.g. no iridium). That made me lose interest in meteor hunting in the region; but it left me wondering what had caused those marble-like lumps to form. What bothered me most about them was that there was a neat "stack" of four evenly spaced horizons upon which these objects were randomly scattered. The four layers were separated, vertically, with what looked, to my eye, like mathematical precision. Since, at the time, I did not realize where this might be heading, I did not bother to make any measurement of the spacing between each layer (maybe three or four inches) or attempt to count the number of varves (annual layers, like tree rings) separating the layers (maybe 75 or 100 years). Except for a few strays (very few - and all of them on a fifth intermediate layer between the top two "main" layers), the objects all sat precisely on one of the four time horizons. I now suspect that, whatever the spacing was, exactly the same number of varves (or years) separated each layer. I have a photo, somewhere, which shows this spacing; I have been trying to find it, but haven't yet. What I learned, while waiting for my marbles, turned out to be quite interesting. According to this site, Moqui Marbles, named after the "Moqui" Indians (more properly the Hopi Indians) come in many shapes and usually have sandstone interiors which are covered with a hard iron-composite outer shell. 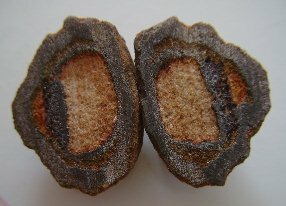 Sometimes they are shaped like hollow pipes, with no sandstone inside (see image left). They are found over a large area, beginning about 10 miles east of Escalante, Utah, and extending all the way to Lake Powell. Part of this area is known as "Big Spencer Flat" (B.S.F.). Like the Green River Formation "marbles," they are also found in a stack of vertically separated horizons (photo link) upon which these strange objects are scattered. For another similarity, the Moqui marbles have cores made of the local Navajo Sandstone (the G.R.F. 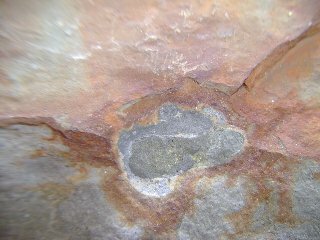 rusty lumps have cores of the same composition as the local Green River Formation limestone). The Moqui marbles have some kind of iron composite shell (the G.R.F. lumps appear to be surrounded by some kind of rusty residue which may have been the remnant of a similar shell which rusted away long ago). 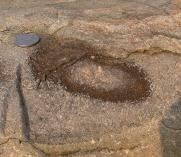 It looked very much like these might be the same type of artifact - but from two different geological environments. There are many theories regarding how Moqui Marbles might have been formed. One common theory, which is presented here, assumes they resulted from of some mollusk-like creature whose remains collected iron from the local groundwater. The iron combined with phosphorous and lime from the mollusk's body to form the hard shell. 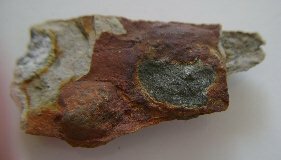 Another site presents an old theory (that they resulted from bubbles in a "scum of iron gel" floating at the top of the water table) but argues for replacing it with a different theory - that they were the result of debris condensing following the impact of a meteor. Yet another site (photo link) first presents the theory that the marbles formed as a result of hot ejecta from a meteoritic impact, but then presents reasons why that theory was abandoned in favor of a theory involving concretions around sand grains from local groundwater. The reasons included the absence of any obvious crater that might have been the impact site (assuming it hadn't either eroded away or been buried over geological time). A variation of this theory is presented here. One last groundwater theory suggests that similarities between these "marbles" and the "blueberries" found on Mars may indicate a similar type of formation process. When I finally got my own "marbles," I immediately borrowed a friend and his masonry saw and cut one of them in half. What I found (first try) I originally thought must have been a one-in-a-million fluke. 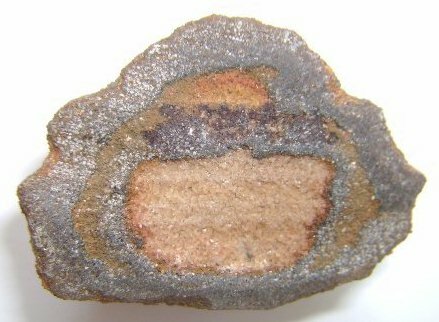 The sandstone core was surrounded by two different concentric iron-composite shells (not just one shell - photo link) with some oddly distributed sandstone in between (approximate cross-sectional dimensions: 2.5cm x 3.5cm). (As it turned out, double "marbles are quite a bit more common than I had assumed.) I remember my initial disappointment that the inside of my "marble" didn't look at all like the others I had seen pictured on the net. Fortunately, I eventually recovered from my sense of having been "cheated" and started trying to figure out what my strange "marble" was trying to tell me. I couldn't think of any obvious mechanism by which those two distinct shells could have formed. It was obvious to me that it was not from either a dead mollusk (that had died only once), or from simple groundwater additions (what could have "moved" the deposition radius outward?). It didn't look like any kind of bubble I had ever seen either (in particular, it didn't follow the laws of bubble merging under which surface tension always minimizes surface area). One question which had particularly bothered me was why groundwater at Big Spencer Flat was thought to add iron to the "marbles" (like electroplating), while the Green River Formation's lake's pore water appeared to have removed it instead (like electrolysis) - this presenting a problem concerning how the iron might have collected around the G.R.F. lumps in the first place. Further, since much of Utah's sandstone (particularly the crossbedded Navajo sandstone) is commonly believed to have been deposited in a dry environment of shifting sand dunes (see also Geologic History of Utah p.45, and Roadside Geology of Utah p.298. ), there remains some question as to whether there was sufficient groundwater present at the critical time period to play a role in the formation of the Moqui Marbles. (The presence of mollusks seems even less likely.) In any case, none of the groundwater theories seemed to fit the evidence which my "rogue marble" presented; but the impact theories also had a few very serious problems of their own. The differences might be explained by the local geology. Normally most of the ejecta form an impact would be either melted or vaporized; but this might not be what happened at these two sites. Originally these sites were a muddy lake bottom and a field of shifting sand dunes; they would both have been relatively "soft" landing sites. The impact bolides might have been able to embed themselves a little deeper than they normally would have before exploding. This would mean that some of the local material nearest the surface (usually sand or mud in these two cases) could get launched, unmelted, possibly as irregularly shaped "dirt clods." Sometimes, these "clods" might contain rocks or broken pieces of branchs or roots. These "clods" would be closely followed (and quickly overtaken) by the melted and vaporized components; they would probably pick up liquid shells (accruing from simple impacts or other interaction during flight). 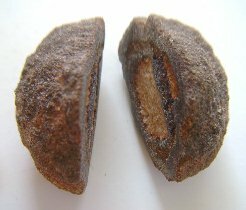 Those shells would be subjected to a similar environment to that of tektites (similar high-temperature chemical environment, mechanical spinning and wind drag etc. - except that they might solidify more quickly, having cooler interiors). This might explain the similarities in exterior shape (and possibly even coloring) between the "marbles" and tektites. Clods which contained branches or roots would probably explain the hollow pipe-shaped structures which are found among the moqui marbles; the organic interriors would have burned or rotted out long ago. Sometimes these clods would probably contain rocks - or, rarely, even another Moqui marble. Although I, very much, wanted to believe I was holding in my hand a remnant of an ancient and dramatic cometary impact, I still had a serious problem with the evidence - and it was a huge one. That theory seemed to imply that my rogue "marble" (and many others like it) had been knocked into the sky twice! Cometary or meteoritic impacts are sufficiently rare that this seemed to be simply unthinkable. There was only one way that kind of "coincidence" could have become even remotely possible: There would have had to have been an extremely dense multiple impact - possibly from a very fragmented comet like Shoemaker-Levy (photo link). Comets become fragmented when they pass within the Roche limit of a large gravitational source such as the sun or a planet. 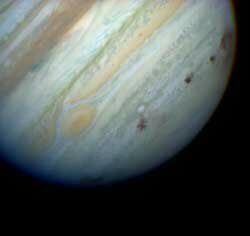 A fragmented comet can impact a planet many times on the same pass like the Jupiter impacts. Incidentally, those "little" impact marks are each about the size of the earth. This means that each of the fragments could be much smaller than these and still make quite a mess when it hit. The impacts at the Green River Formation, and at Big Spencer Flat, would have needed to have been much smaller than the Shoemaker-Levy fragments were. This would require either a much smaller comet or a much more fragmented comet - or both. If we take this far enough in the much-more-fragmented direction, we might begin to get a dense enough distribution of small impacts that a "double-launch" for the same clod of dirt might begin to become a possibility. The next part of the puzzle involves the "precisely" spaced layers. If those layers happened to be tied to a single comet's period, that might explain their "clockwork" spacing in the Green River Formation (close examination of the Big Spencer Flat three-layer "stack" also suggests possible "clockwork" spacing), but it would not easily answer the question of how ejecta from that comet ended up in exactly the same part of the same Green-River-Formation lake (or the same Big Spencer Flat sand dune area) every time that comet passed. If a short-period comet were to become sufficiently fragmented, and if those fragments were to be spread out over nearly a year's travel time worth of its orbital path, and if it's orbit also happened to be earth-crossing, then it would be possible that many small parts of that comet could impact the earth each time that comet came around. Further, if the comet were also distributed over a wide enough path that it crossed about a day's worth of the earth's travel distance, it could impact the earth from every side as the earth rotated through its "cloud." In this way, given a sufficiently large number of cometary fragments, nearly every part of the earth might have been struck by parts of the same comet on each of a series of its sequential passes. 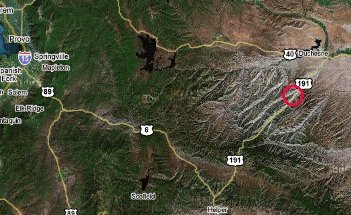 If it always impacted nearly everywhere, it would be less of a surprise that it happened to hit the same part of the same lake on four passes in a row. I have chained quite a few "if"s and "and"s together in the previous paragraph; however, cometary fragmentation appears to be more common than might be expected. This site describes the observed breakups of many comets, including an entire family of comets called Kreutz Sungraszrs (image link), which all appear to be fragments of fragments of a single comet (which may originally have been the comet observed by Aristotle and Ephorus in 371 BC, and which was observed by Ephorus to break into two parts). There are presently many hundreds of known fragments of this comet (including many large fragments which are major comets themselves). These fragments are strung out over more than a hundred years worth of the original comet's orbit. There is evidence that cometary fragmentation is responsible for the rings of the outer planets. As the Kreutz Sungraszrs continue to break up, the resulting fragments appear to be filling in the gaps of a giant, but presumably short-lived, elliptical ring which is presently being formed around the sun. If such a ring were to cross the path of a planet or Kuiper belt object (K.B.O. - image link), the consequence might be regular "yearly" (or possibly twice-"yearly") impacts. If such a ring were merely to come close to a large planet or Kuiper belt object, then a section of it could be diverted into an earth-crossing distribution similar to the one described by the preceding chain of "if"s.
Since all we are looking for is a single year's worth of distribution, and since we appear to have a hundred million years or so to wait for just the "right" kind of fragmentary distribution, there is a pretty "good" chance that the earth might have encountered two such comets (or "ring fragments") during its long history. This might explain the multiple-layer sequences of "marbles," both in the Green River Formation and in the Big Spencer Flat area. This, at least, seems more reasonable to me than the alternative theories do. It, at least, uses the same "fragmentation" model to explain both the "double-launch" of the "double marbles," and the "stacks" of layers at both locations. I suspect that we are looking at evidence for two separate, and fairly unusual, "cometary" impact sequences. If these "marbles" (at both locations) result from the sort of cometary encounter I am suggesting here, fairly severe consequences might be expected. 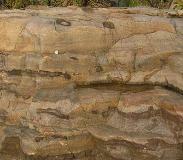 At the Green River Formation, the "marble" layers are very near the top of the mile-thick formation. The geological time slot, where this formation begins and ends, varies greatly as one moves from location to location. A cross section of the location, where those "marbles" are found, is found in the book, Geologic History of Utah; close inspection of the geological diagrams on page 156 suggests that the formation might extend up to (or at least very close to) the Eocene extinction event (see also here) - whose cause is still a matter of some uncertainty. The dating of the Navajo sandstone from the Big Spencer Flat area is a bit controversial. 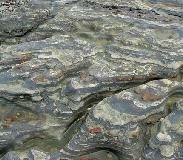 It is believed to be at least as old as the Early Jurassic, but might possibly be as old as the Late Triassic. This puts it roughly at the Triassic-Jurassic extinction event. It is at least possible that the Moqui Marble layers fall exactly at this extinction event. The question of why there is no obvious crater, at either location, deserves some discussion. Both of the rock formations we are examining here are quite old. The Eocene extinction happened about 35 million years ago; while the Triassic-Jurassic extinction took place roughly 200 million years ago. Because of the "rock cycle" (see also here - image link), this far back in time, we would expect that much of the original surface of the earth would have already been eroded away. The lake bed which originally formed the Green River formation is now a range of mountains; and the layer which contains the "rusty lumps" is very close to the peaks of these mountains. There is very little chance that any crater would have been located precisely on one of those present-day peaks. Likewise, much of the original Navajo sandstone is also believed to have eroded away; in fact, it is thought that it might once have covered an area as large as the size of California. Furthermore, the present theory suggests that there would have been multiple small creaters instead of a single large one. Smaller craters might be more easily eroded away or even simply missed (even if they would also be more numerous). The question of why no Iridium was found in my G.R.F. samples is still a bit of a mystery. This article here appears to suggest that it isn't really a major component of tektites either, but that material from the surrounding layer might have been a better place to look for it than the marbles themselves were. If the theory I am proposing is correct, there should be iridium in each of those layers - at both sites. That same article also describes evidence for a major impact event, very close to (if not exactly at) this geological time horizon, but which is evidenced by tektites found in a Caribbean seafloor drill core (DSDP-149). This Caribbean tektite field was once thought to be part of the North American strewn tektite field [pdf] (from the Chesapeake Bay impact), which was also close to (if not exactly at) this same horizon, but the evidence pointed to yet another separate impact event. According to the theory I am suggesting, there should have been a great many impacts of varied sizes, all over the earth, at "exactly" that time.. Although work done by Dr. Ken Farley at Caltech and Gene Shoemaker with helium 3 (which is rare on earth but common in extraterrestrial materials) shows that there actually was a literal shower of comets (including the ones which caused the Chesapeake Bay and Popagai craters) at about this time, that shower does nothing to confirm the present theory; instead, that shower appears to have extended over a period of about 2.5 million years. (The amount of Helium 3 which is present in sedimentary layers shows how much cometary debris had been settling onto the earth at the time those sediments were deposited). Although that shower does make the kind of cometary event which I am suggesting here more probable, it also makes it more difficult to identify, since evidence might become lost in the other cometary activity. Testing helium 3 levels in the G.R.F. sedimentary layers might at least show whether or not those rusty lumps were formed during the 2.5 million-year window when that cometary shower happened. At present, it is not obvious whether Dr Farley has extended his work back far enough in time to determine if the Triassic-Jurassic extinction was also accompanied by an increase in helium 3 levels. While researching for a different topic today (2009/10/27), I stumbled across a discussion attempting to explain some very similar "rusty lumps" (images right and left) in Archaean sandstone. See here and here. One contributer called the concretions "armored mudballs;" this description sounds very much like what I am suggesting here. Like both the G.R.F. "rusty lumps" and the Moqui marbles, these strange objects seemed to have iron-rich shells, cores comprised of the local material, and to be organized into a sequence of horizontal layers. 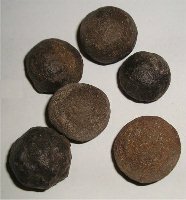 Unlike either, some of these "marbles" appeared to be shaped more like big mossy "Frisbees" than like marbles or hollow pipes; and because of the extreme antiquity of the rock, the possible biological explanations were extremely limited. 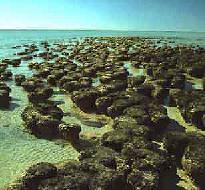 Since these odd objects were found in Archaean strata (before any life forms other than algae existed), the suggestions involved algae mats called stromatolites (see image to lower left). The concept of an "armored Frisbee" is certanly frightening, especially if one imagines it to be spinning through the air (as the present theory suggests). Another contributer had seen similar rusty structures in a formation near Monterey, California, and provided a link to this page (image near right). This picture shows a small piece of the Carmelo Formation which is supposed to date from the paleocene epoch (but I ought to check this for a possible match) - putting it in the epoch immediately preceeding the Green River Formation's epoc (the eocene). 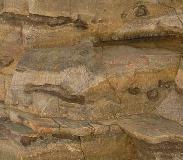 Once again, we see a sequence of horizontal layers of small rusty lumps, this time in mudstone (click on the image to see the larger original). Three or possibly four layers appear to be visible in the picture. 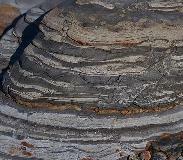 The picture to the far right also shows a sequence of layers of rusty lumps in the Carmelo Formation. Link to a page showing a similar theory involving asteroids instead of comets. 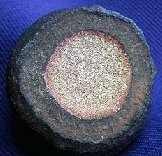 1) The "marbles" were formed by ejecta from multiple impacts - all from a very large and very fragmented "cloud like" comet (or "ring fragment"). A new barrage of many small impacts happened each time the "comet" passed the Earth's orbit (the earth passing "through" the cometary cloud). (The encounter could also happen every 2nd or 3rd time (etc.) the comet passed, if that comet had a period which included an integer fraction of a year: 1/2, 1/3, 2/3, (etc.). 2) The "comet" was so badly fragmented that its "cloud" was stretched out over a large enough fraction of a year's worth of it's earth-crossing elliptical orbit, so that the Earth had a good chance of hitting it each time it passed. 4) The impact debris (and maybe a few direct hits) messed up the Earth's ecosystem enough that both encounters (G.R.F. and B.S.F.) caused fairly major extinction episodes. 6) G.R.F. only: After the fourth pass, an outer planet (or K.B.O.) messed up the orbit of at least a significant fraction of the remainder of the cloud - enough that it had no more significant encounters with the Earth. 7) B.S.F only: After "three" passes (here I am depending on a count from a source which I have been unable to verify), an outer planet (or K.B.O.) messed up the orbit of at least a significant fraction of the remainder the cloud - enough that it had no more significant encounters with the Earth. 8) The shells of the G.R.F. marbles rusted away because they landed in an underwater (lake-bottom) environment; the shells of the B.S.F. marbles remained intact because they landed in a relatively dry (sand dunes) environment.